For this post, I used the version of Wassily Kandinsky’s On White II abstract painting I created a while back and give it some animation. For this, I used frame based animation and manually moved around layers of the piece. When I tweened the layers the way liked, I copied and pasted them again, then reversed it. I wanted to give the animation of a look of being deconstructed and then reconstructed so the animation starts and ends with the full painting. In Eagleyedon Says’ blog post, my attempt at art, the author attempts to recreate an abstract painting by CJ Morgan, entitled Jazz & Nature. The very first thing I read right off the bat was “I horribly tried to copy this painting using PhotoShop.” Well, the first mistake is using the word “horrible” in any form because Photoshop is a difficult and sometimes intimidating program to become acquainted with. The key to the recreation is that you have the ability to give your own take on the original. While the author found it difficult to copy the colors, I thought what was used worked quite well. In the future, the eyedropper tool (if you did not use it) is most helpful in the area of color. 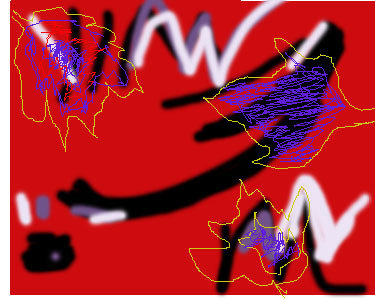 I thought the use of brush strokes was also very well done, as a relatively seasoned Photoshop user, I tend to stay away from the brush tool and I know it is not easy to get used to. I think considering the leaves were traced with the pencil tool (again, another tool that takes getting used to), the job tracing the leaves from scratch was solid. In the future, it is easier to take the leaves drawn and go in Blending Mode (right click on the layer) within that layer and add a stroke or glow to it (which will save you time rather than retracing the outside). If you created a shape of the leaf you like, I would recommend duplicating the layer and resizing so they look a bit more alike, rather than drawing a new one over again. Grace Hartigan. The Vendor. 1956. In reviewing the post, Having a Voice Through Abstract, in the blog, Bona Fide Alley, there was a much different abstract recreation here. While many of my peers (including yours truly), focused on recreating the original piece of abstract art, here we have a piece that seeks to capture the feel of the original as opposed to being a recreation. As far as originality is concerned, this is a very creative and detailed piece. The varying colors, the use of the canvas, the unpredictable nature, the diverse use of brushes and perhaps filters shows that a lot of time and effort was put into this. The color choices do not really remind me of Hartigan’s piece, The Vendor (as The Singer is much brighter), but that was purposefully done and I do like the choices made very much. The white lines (which look as though it was created with a filter) over the light blue and pink indicate a good sense of flow and movement. The Singer puts its own unique take with varying colors to evoke varying emotions, shapes and a different version of the on-looking faces. I think the choices here were bold and done with purpose, trying to recapture the emotions of The Vendor and, to me, that goal was accomplished. Where I feel the piece needs work is in the explanation. 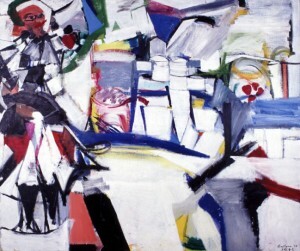 There was much detail and description put into the interpretation of Hartigan’s painting, but what about the recreation? Hartigan chose The Vendor, so why The Singer? This really is not a criticism, as abstract art is sometimes best suited to the viewer’s own imagination, but I would like to read a little more in depth about the theme. What are you trying to say about popular culture’s ever-changing times? How does music or “The Singer” fit into this in your view? Also, what tools in Photoshop were used? I read that various layers and opacity were used, but what tools were used to accomplish this? 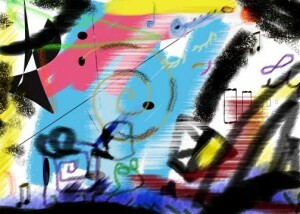 Brushes, fonts (for the music notes), filters, pen tools all seemed like they may have played a role in the piece. It makes the piece slightly harder to judge without really knowing the process that went into it. There appeared to be a lot of time and detail that went into this (it would take me quite a while to conceptualize), so I would not sell myself short on that. Overall, while many of my peers have admitted they are novices when it comes to using Photoshop, this does not appear to be the case. 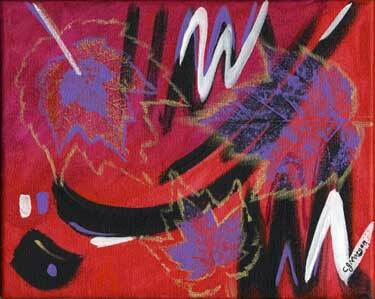 With this piece I will say that Julie captured the essence of abstract art in The Singer. I could provide Photoshop tips on how to make the painting itself better, but I feel it would only take away from the originality and concept of it, which is the mark of a job very well done. 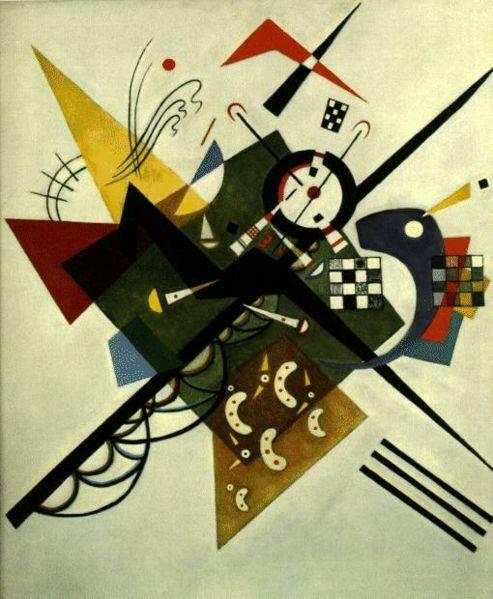 For my recreation of an abstract painting, I chose the 1923 painting, “On White II” by Wassily Kandinsky. I found the painting particularly interesting because it deals with color, form and geometric shape, rather than any actual subject matter. 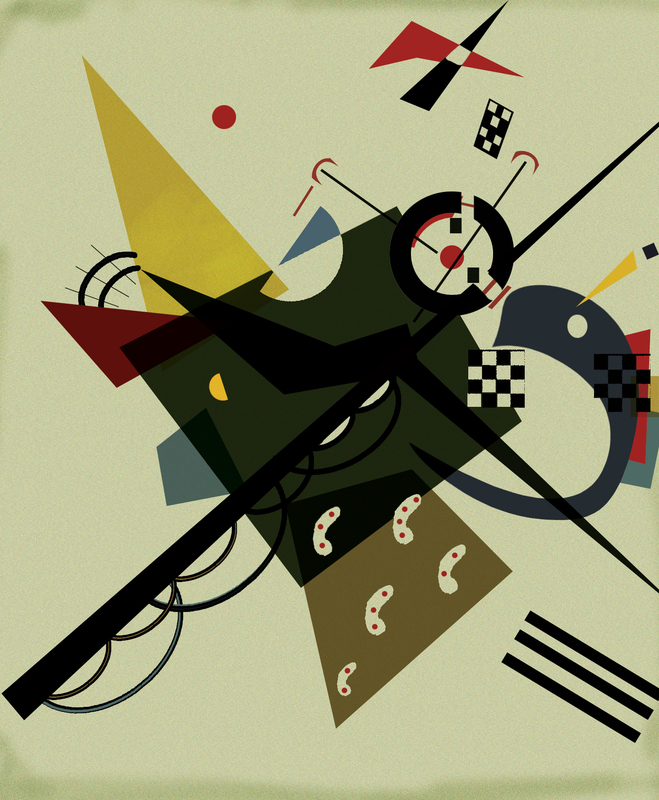 Also interesting to note, Kandinsky is one of the pioneers of the modern abstract movement, so I wanted to create a slight homage to the painting and find a little challenge using some of the Photoshop tools I don’t use all that often (Pen and Brush tools). My recreation of "On White II"
Overall, I am not disappointed with the way the recreation turned out and tried my best to do the painting “justice.” In the future, I would like to experiment a little more with filters and I have to believe there is more shortcuts to learn when creating shapes.